The West is becoming a living Temple to Satan. 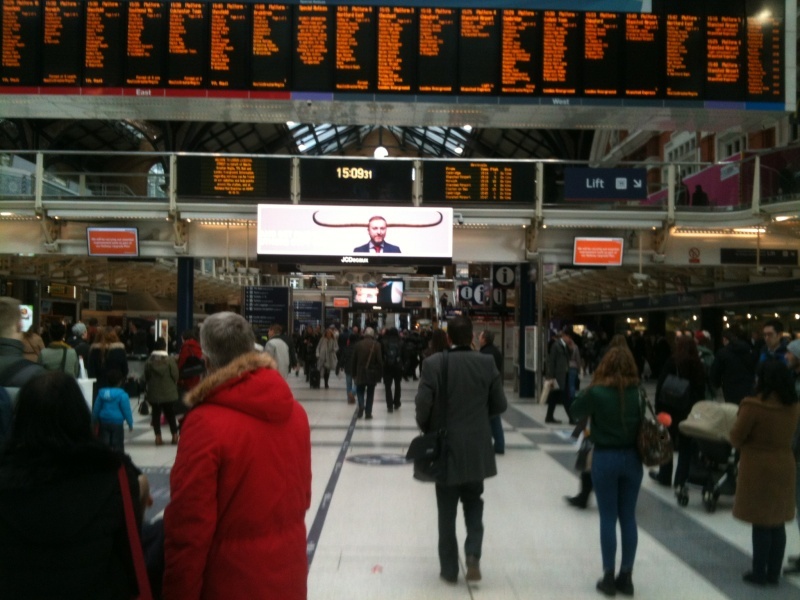 Passing through Liverpool street station the other day, and it was hard not to notice the overt satanic imagery high on display above everyone's head in the guise of an advertising board. I mentioned this to my friend and he said he also saw it when he was last in Liverpool street some time ago. What's more this is the only advert on a constant loop, seemingly at all times. 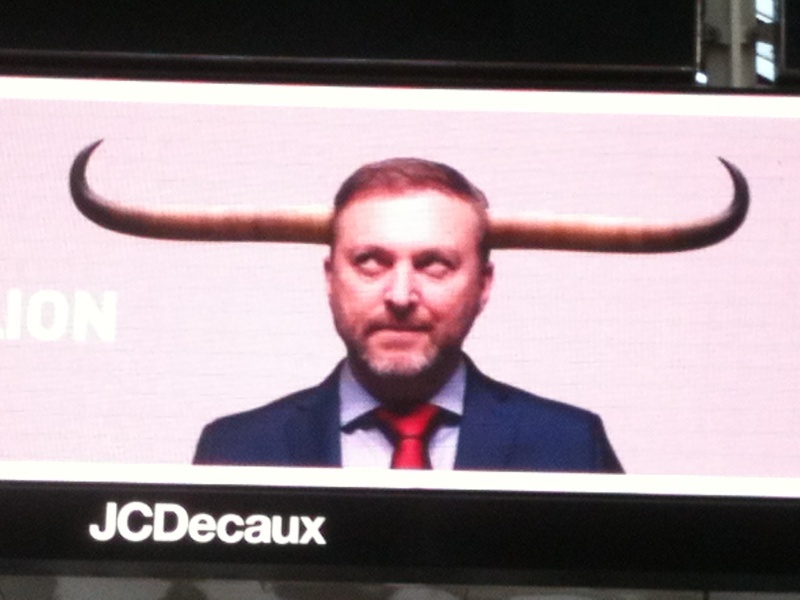 Ostensibly it is an advert for a investment firm: ElToro (The Bull) and hence one can understand the appropriatness of the horns..... But why choose this company? Why have this on a constant loop without any other adverts? 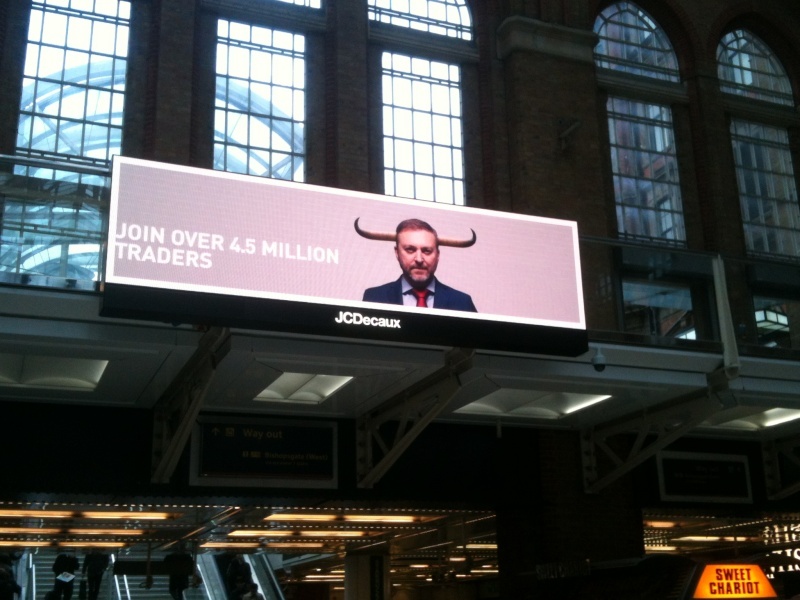 Surely there must be plenty of companies willing to pay top dollar for digital advert space at Liverpool Street station. It just strikes me that this is further evidence that the world is slowly starting to become overtly dominated by Satanists and Satanism. We have seen how anyone investigating child abuse gets discredited, mocked and even imprisoned, while those perpetrating the abuse are usually exonerated by a crooked committee or investigation, chaired and run by child abusers themselves. When Satan and Satanists starts to show themselves out in the open....we've all had it...... and one thing's for sure, your children are no longer safe anywhere in this Satanic society. People under the gaze of Satan/Moloch in central London. 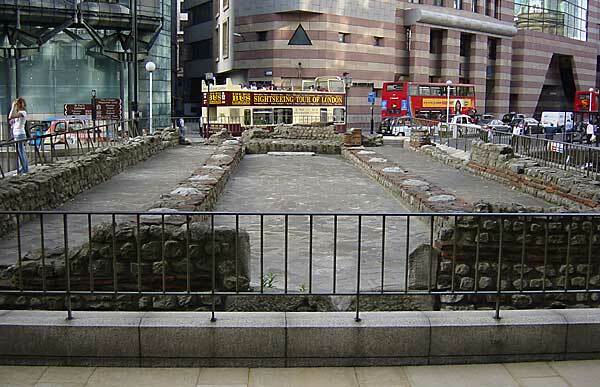 Also they have recently moved the Temple of Mithras from Canon Street and are planning on setting the temple into the basement of a new Bloomberg building..... bit of a homecoming for the Canaanite Jewish faction I would say. Now the site is being redeveloped again, and the temple will be incorporated into a new Bloomberg building. It should be on view to the public again by 2017. The surprise for the archaeologists was how much remained at the original location in Roman times on the banks of the Walbrook stream. They assumed every trace had been bulldozed for the 1954 block, but found extensive foundations and a pickaxe left behind by their predecessors. Aparently the bulding is being reconnected to its originally foundations which will be in the basement of the Bloomberg building. To me it seems clearly like a ritual and I wouldn't be surprised if some poor unfortunate victim finds themselves under the temple as a human sacrifice when it is finally put in place. And that kind of huge image with subconsciously seep into the minds of thousands of people daily, who knows what effects it could have. We should find our way into the Bloomberg basement and keep defacing their work. Maybe a Palestinian flag here and there. We should tag it like we're a bunch of freedom fighting Muslim activists, that'll really get their gears grinding. A 15-metre replica of an ancient stone arch in Syria that apparently survived a furious Isis bombing campaign will be built in Trafalgar Square. The archway, which is 2,000 years old, may be all that remains of the Temple of Bel in the city of Palmyra. Satellite pictures reveal the temple was all but levelled in late August or early September but it is not known whether or not the arch itself has since been destroyed. Now the Institute of Digital Archaeology is planning to build a lightweight replica in the shadow of Nelson’s Column to coincide with World Heritage Week. “It’s a very attractive structure,” she said, “and it’s free-standing. “The engineering is quite simple, it’s not going to fall over and there aren’t any delicate bits that are difficult to reconstruct. She added the installation, in front of the National Gallery, would reinforce one of the institute’s key messages.